A Higher Score in Less Time! REA's AP® Computer Science Principles Crash Course® is the top choice for the last-minute studier or any Computer Science Principles student who wants a quick refresher on the course. Are you crunched for time? Have you started studying for your Advanced Placement® Computer Science Principles exam yet? How will you memorize everything you need to know before the test? Do you wish there was a fast and easy way to study for the exam AND boost your score? Targeted Review - Study Only What You Need to Know. The review is based on an in-depth analysis of the AP® Computer Science Principles course description outline and sample AP® test questions. It covers only the information tested on the exam, so you can make the most of your valuable study time. Expert Test-taking Strategies and Advice. 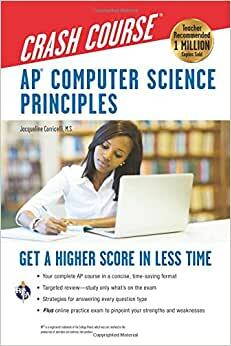 Written by Jacqueline Corricelli, an award-winning AP® Computer Science Principles teacher and test development expert, the book gives you the topics and critical context that will matter most on exam day. Crash Course® relies on the author’s extensive analysis of the test’s structure and content. By following her advice, you can boost your score. REA's Online Practice Exam. Are you ready for your exam? Take REA's practice exam and find out. You'll get the benefits of timed testing, detailed explanations of answers, and automatic scoring analysis. Our practice exam is balanced to include every topic and type of question found on the actual AP® exam, so you'll be confident on test day. Whether you're cramming for the exam or reinforcing what you learn as you go through the course, this is the study guide every AP® Computer Science Principles student must have. Jacqueline Corricelli earned her B.A. in Mathematics and Statistics from the University of Connecticut and her M.S. in Mathematics Secondary Education at Westfield State University in Massachusetts. In 2013, she received the Presidential Award for Excellence in Mathematics and Science Teaching, the United States' highest honor for K-12 teachers of mathematics and science (including computer science). In 2017, she was one of just 10 teachers to be honored with the Computer Science Teaching Excellence Award. This international award is sponsored by Infosys Foundation USA; the Association for Computing Machinery, the world's leading computing society; and the Computer Science Teachers Association. Ms. Corricelli teaches AP Computer Science Principles at Conard High School, West Hartford, Connecticut, and serves as an independent consultant to the College Board for the AP Computer Science Principles Course. Jacque Corricelli earned her B.A. in Mathematics and Statistics from the University of Connecticut and her M.S. in Mathematics Secondary Education at Westfield State University in Massachusetts. 5.0 颗星，最多 5 颗星Things have come a long way. Please permit me – I'm reviewing this book from a bit of a different angle – I'm not a high school student or a CS/CS Principles teacher. I am an artist formerly known as a Chemical Engineer with a minor degree in psychology and a major degree in Film and Animation Production. I am a small business owner in Los Angeles and a professional website developer who works with all sorts of content producers to build and maintain dynamic websites as a primary part of my business. Much of what I know today I had to learn by piecing together academic programs and projects on my own. During a recent conversation at a local Meetup, several other developers and I were discussing how deficient our own primary education was in computer science and I was wondering whether or not the foundation of computer science education had evolved to keep up with the pace of today's innovations. I purchased this book based on a recommendation from one of those developer friends and I must say things have come a long way. I'm reviewing this book as both a back and front-end web developer, as an artist and as a former Apple employee. I'm reviewing this book as a person who works with individuals and companies to help them get (and stay secure) on the web and to help them vet potential staff to do social media, website and app development projects. I'm also reviewing it as both a former Advanced Placement student that has taken several AP exams and the father of someone who I hope will have the opportunity to take this course. With that framing, I'd like to commend the AP board for putting together this course which helps introduce and develop the interpersonal and mental skills, theories, semantics and syntax required of the Computer Sciences. Both the course and the exam which this book supports should (in my opinion) be required of all high school students and completing this course and the exam will indicate a great potential for success in one of the most sought after skill sets in the modern workforce. I'd also like to thank both REA and the author for putting forward this first edition book that takes on a monumental challenge; To platform agnostically support the teachers and the curriculum involved with this course and to provide a well-structured and relatively easy to consume pathway to success for the students who are willing to participate. General computer science principles are all, by their nature, very complex topics, involving all sorts of multidisciplinary skills. As a direct result, the AP exam for CS Principles is also necessarily complex. The first thing I noticed while reading this book is that this exam is not just a "multiple-guess" scantron exam and a few essay questions. Prior to answering a single question, you or your child could easily become lost in its requirements. That is one of the great successes of this book. Like a good developer, the author separates and breaks down each section of the exam into very digestible sub-sections and provides very clear real-world examples of what success can and should look like. This author is clearly someone who knows how to work with others and reach for lofty goals. A chunk of this exam is the traditional multiple choice questions that we are all familiar with. The other two parts (The Explore Performance Task and the Create Performance Task) combine with that exam to truly function as a comprehensive proof of potential success in future endeavors dealing with Computer Science. It is important to note that this book should not be read as Cliff's Notes for the course. Nor should it be used as an instruction booklet on a particular programming language. If I'm reading it correctly, I believe that this book's direct purpose, and where it is exuberantly successful, is not in replacing the classroom experience but in supporting and directly complimenting what is happening in the classroom. I believe that it is intended is to act as a supplementary guide in hopeful support of your [or your child's] future successful completion of the course. I believe that this course and the exam (and by extension this book) are designed to, in their structure and exceptionally detailed requirements, prove that you have the ability to work and think collaboratively with others within an advanced computing environment. It is also designed to help the students learn how to "get to the point" thoroughly and accurately. I also believe it is intended to help you learn how to reason through what are seemingly infinite options, provide reasoned solutions to complex problems and to be able to document and justify your selected solutions when you are, inevitably, challenged to do so. In addition to the structural support of the examination, the author of this book provides great tools (many of which are free), online resources and thought provoking ideas that you or your child can use to demonstrate the skills required for success. I specifically appreciated that she provided options that ranged from technical, code driven topics like building custom apps, to suggestions like creating a video or an infographic that may open student's eyes to more creative alternative paths to success. The ability to collaboratively translate human needs into language that a computer can understand is a key pathway to success for the future. I can easily imagine the combination of this book and a passionate teacher at the helm of the course could truly be life-changing. Yes, to be successful in this course, you are going to have to learn some "coding" – but – I challenge you not to think of it as "coding" but think of it as learning a new language. These devices, apps, websites and programs (whatever you want to call them) are "tools" and we all use these tools both personally and professionally everyday. I see this book and this course as a great place to start to gain the ability to speak the language of these tools. This book does an amazing job helping students, teachers and, (hopefully) parents get started toward one of the greatest tools that you, your child and your students can have in their toolboxes. Whether you are already a veteran developer who is just looking to get college credit or an artist that is looking to see what all of this "coding" and "development stuff" is about. This course, and the successful completion of the exam will get you started and this book will help guide you toward achieving success in this course and beyond. This book is extremely useful! It has helpful tips throughout chapters, a glossary, and even a code to access a practice exam! I am a Computer Science Principles student who bought this book as a way to increase my odds of getting a 5. I felt like I could definitely pass the exam, but I wanted something extra to take me to the next level. The book did a good job of showing examples with the type of Pseudo code that is used on the test. However, they really put the Crash in Crash Course. The practice questions felt frustratingly complicated (more complicated than the actual Collegeboard released questions) and the guidelines given for the Explore and Create task were too loose for me to consider them helpful. All the explanations for the answers felt "sloppy" and made no sense. That being said, the questions on the test felt relatively easier than the book, which I guess you could say prepared me. The only thing that I felt was helpful was the glossary terms in the back of the book. All the other information can be accessed online for free and better explained. Excellent workbook for High School students. 4.0 颗星，最多 5 颗星Didn’t make a difference for me. I was supposed to buy this for my AP Comp Sci Class, and I feel like this is for students who don’t have good teachers or any prior coding experience. This didn’t make a difference for me so I’m giving it three stars.